Q: So excited to discover that Spotify not only offers playlists, podcasts but also audiobooks for enjoying. I have subscribed to Spotify Premium to get the 'Download' option to download Spotify audiobooks offline but I still couldn't transfer downloaded Spotify audio books to my MP3 player for playback outside. I guess I need to convert Spotify audiobooks to MP3 for syncing. Is that right? If yes, how to do it? Yes, you are right. Spotify encodes its audio files in Ogg Vorbis format along with DRM protection and itself doesn't support for MP3 download, which leading Spotify users, no matter for free or premium one can't play Spotify content on portable devices, like MP3 player. If you want to listen to Spotify audiobooks on your MP3 player for some reasons, like playing audiobooks offline when running outside, etc. a third-party audiobook converter for Spotify can help you fix it out. 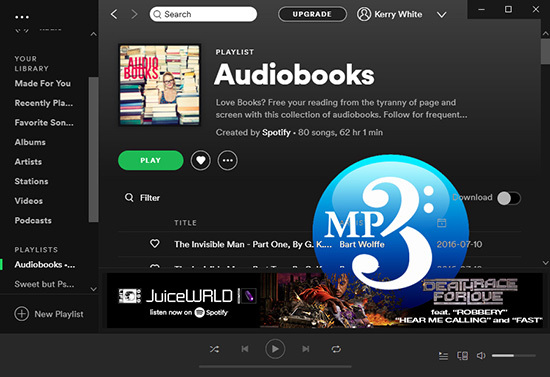 In this article, we will introduce the best Spotify to MP3 converter and show you the detailed tutorial on how to download Spotify audiobooks to MP3 with no effort. Apart from iTunes and Audible, Spotify is also one of the professional audiobook providers you can't miss, in which audiobook lovers can discover exclusive audio books for listening to with no cost. Since there is no direct navigation bar allowing you to access to audiobooks on Spotify, you might have perfectly missed this wonderful feature of Spotify. In general, it's easy to get. Just go to the left menu bar to hit on Browse > Genres & Moods > Word option, you will find out the collection of Spotify audiobooks and listen to favorite audio books online. With Spotify Premium subscription, Spotify users are permitted to download Spotify audiobooks for offline listening. However, all Spotify audiobook downloads are cache files that can't be located. 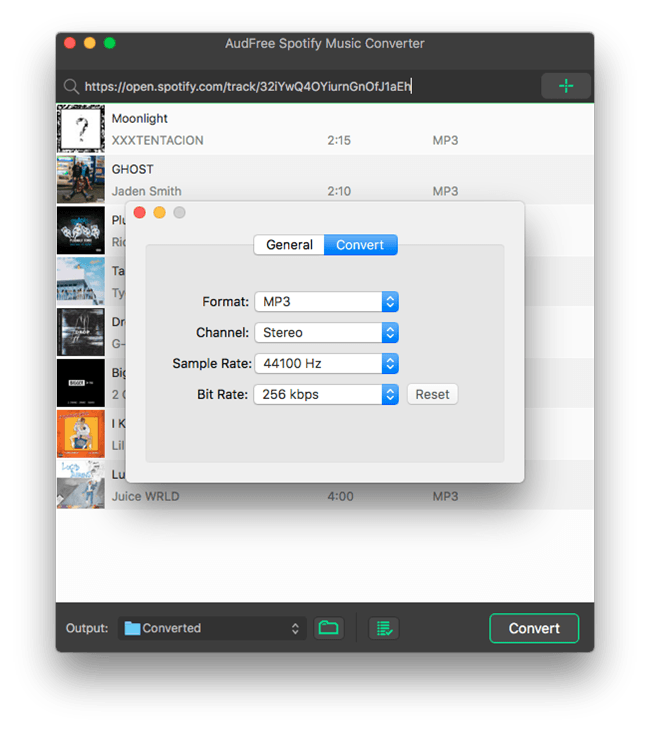 As result, you can't use a common audio converter to convert Spotify files to MP3. Here, you'd better to download and install an ultimate Spotify audiobook downloader and converter that can download Spotify audiobooks as local files as well as convert them to MP3 for playing on MP3 devices. 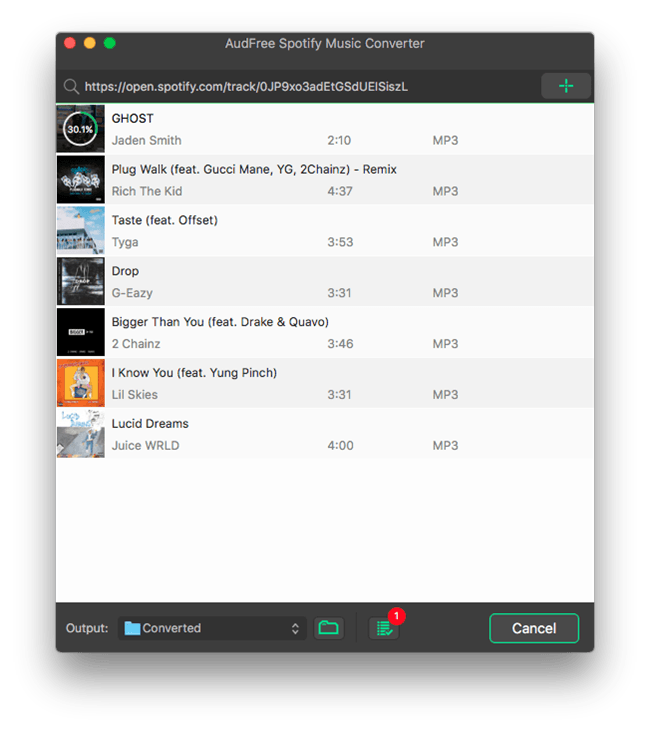 AudFree Spotify Music Converter is such a powerful solution to finish Spotify audiobook and music MP3 conversion. Besides exporting Spotify books to MP3, it supports for FLAC, WAV, AAC, M4A, M4B output formats for better enjoying audiobook entertainment. Convert Spotify podcasts and playlists to MP3, FLAC, etc. 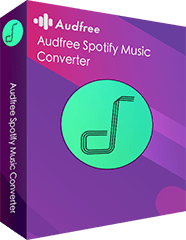 When you open AudFree Spotify Music Converter, Spotify app will be launched automatically, which can make it easier to load Spotify audiobooks to AudFree. Just drag and drop audiobooks from Spotify to AudFree's main conversion window or copy the Spotify URL and paste it to the search box of AudFree and click '+' button to add them. Tips: If you are Spotify premium users and like to download audiobooks from Spotify offline, you need to create a playlist for audiobooks so that you can start the downloading conversion. To choose output format as MP3, please enter to 'Preferences' > 'Convert' button to get the setting window. And then you can define output format as MP3 to export Spotify audiobooks as MP3 files. If you are using Spotify free account, you can customize other output audio parameters, like bit rate, sample rate, audio codec, etc. according to your needs. Finally, you can press the 'Convert' button at the right corner of the main interface to start converting process. 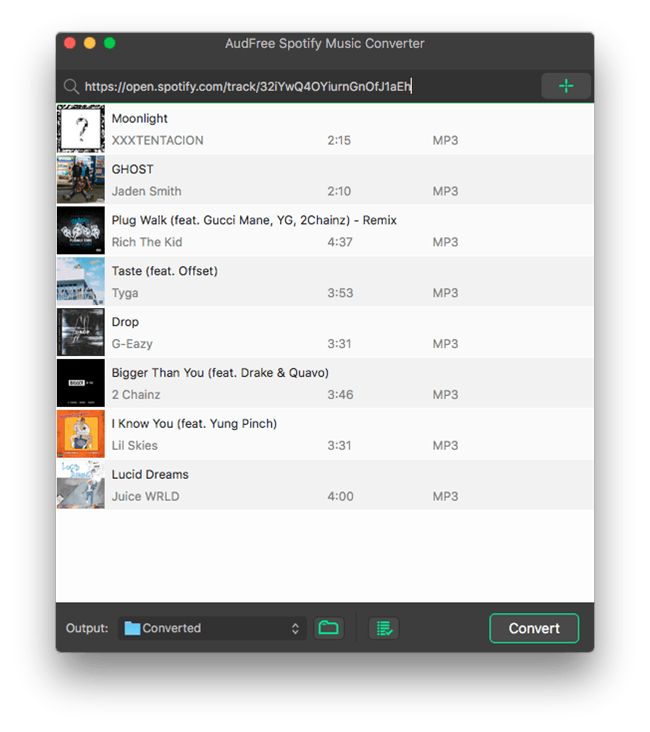 AudFree Spotify Music Converter will start to extract MP3 files from Spotify audiobooks and save them as local files on your computer. After conversion, just click the 'file' button or 'search' button to locate destination folder directly. Congratulations! Now, you have gotten Spotify MP3 audiobooks on your computer and you can find the local files and own them forever no matter whether you have Spotify Premium or not. There is nothing to do but to transfer MP3 Spotify files to your popular devices for playback via USB cable, such as saving Spotify audiobooks to USB for backup, syncing them to MP3 player for listening on the go, etc. Just do it as you like. How to Download Spotify Podcast to MP3 How to Convert Spotify Music to MP3 How to Edit Spotify Song Info? Solved!